It seems that you just keep filling the barrow and moving it but the pile stays the same. If you compare this with last month you can see it is getting smaller. Please say you can see it getting smaller! You can see one of the piles of compost at the top of the plot but if you notice the sky is looking a bit heavy. About ten minutes later the clouds started to dump the rain on me. In front of the shed, the path is churned and the top few inches are just wet mud. The worst danger is slipping and falling over. I sat on the bench seat at one point and felt it settling down. At this rate we'll be putting "Beware Quicksand" signs up. These two were having a great time charging up and down through the puddles. If the girls can do it so can the older brother! Compost is not just for growing vegetables! The compost mountains are not just for growing vegetables, oh no. They are for climbing up and rolling down and having a great time with. This young lady is obviously detined for the stage or the catwalk - a born model making an unusual fashion statement. There it was on the next plot, stood between the weeds, a little daffodil showing that things are definately early this year. Andrew Carver, son of our National Vegetable Society chairman John Carver, is a good grower in his own right. Here he shows some members the polytunnel where they grow their show winning parsnips in blue barrels. John Carver shows members how he grows show-winning long carrots in deep bins filled with coarse sand. The wooden stakes are removed and the hole filled with compost into which the seeds are sown. In the background, right of shot, you can see John Bebbington, an NVS judge and show winner himself. Unlike the Grace in the film, John grows onions in this double-glazed, underfloor heated and grow-lighted greenhouse. Grace grew another crop entirely! It's really rather beautiful in the yellow light of the sodium vapour lamps. The onions are, of course, incredible. This is hobby growing rather than food growing but John Carver insists everything he grows tastes well. After the tour of John Carvers garden and growing houses we stopped for a chat in his workshop. We meet the second Tuesday of the month and details of our District Association can be found on the NVS Crewe & Nantwich web site. 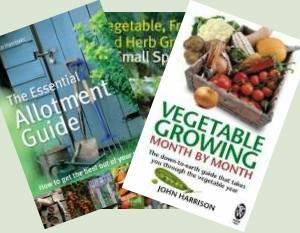 The national society web site is here - National Vegetable Society and has information on the local associations. This view down plot 5 after the first pass with the Merry Tiller. It's a wonderful machine and still working as new after 30 years. Each pass took just over an hour and by the end of the second pass the soil was becoming fairly fine. After letting it settle for a day or so, one more pass and it will be ready for planting. On the left you can see the magnificent greenhouse staging in use. Constructed for £17 and a few hours work this engineering masterpiece is the envy of the site, honestly. Actually it does the job rather well. You might notice the slabbed floor with gravel running to the deep bed on the right. This is the coldframe set on a deep bed by the large greenhouse. It's quite a clever idea combining the deep bed with a coldframe which is fixed to the bed by four bolts so not too hard to remove when things warm up. I'm pushing some first early potatoes in there. Deep Bed Gardening or Growing Wine? My neighbour's plot shows an unusual method of building a deep bed, upturned wine bottles forming the edge of the border. I kid them on, of course, that they're trying to grow a wine tree. It is a a clever idea and seems quite effective although the drawback is that you have to drink loads of wine.. or is it that the benefit is having a great excuse to drink loads of wine? They're Deep Bed crazy, they're deep bed mad! With our heavy soil deep beds offer an easy and effective solution and most of the newcomers to the allotment site seem to have decided to go down that route. These two plots are being developed after being recently taken over and the beds have appeared. One thing for sure, after someone has invested £150 in wood plus the labour they're less likely to lose interest halfway through the season.